Could Russia cut undersea communication cables? Media captionSir Stuart Peach: Russia poses a "new risk" to economy and ways of living. The UK's top military officer has warned that Russia could strike a "catastrophic" blow to the economy by targeting communications and internet cables that run under the sea. 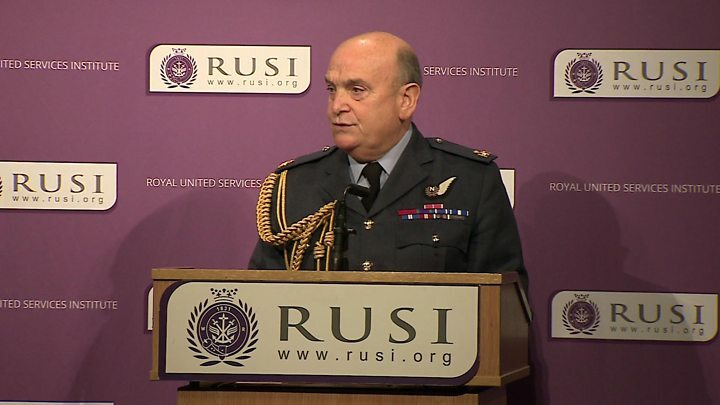 Air Chief Marshal Sir Stuart Peach, the chief of the defence staff, said the lines could potentially be cut or disrupted. Is that something Russia's likely to do? What would happen if they - or someone else - did such a thing? They provide internet and communications links between separate countries and continents. The full network of around 428 cables spans 683,508 miles (1.1 million km), circling the globe. Huge quantities of data fly around under the waves, in cables filled with fibre optics - strands of glass as thin as a sheet of paper. Unfortunately, while their technology is reliable, these pivotal cables are physically fragile. The fibres are encased in steel wire and then coasted in plastic - but many cables are still only around 3cm in diameter. Natural disasters can damage them and even a ship dropping anchor can sever a cord. That's happened before at the port of Alexandria in Egypt, straining connections between Europe, Africa and Asia. Why are defence chiefs worried? The BBC's defence correspondent, Jonathan Beale, says fears of Russia cutting, disrupting or "wire-tapping" undersea communication lines are growing. Defence and intelligence chiefs cite the country's modernised navy, increased submarine activity and willingness to use information warfare. Russian subs are increasingly present in the North Atlantic, particularly the GIUK Gap, a strip of ocean between Greenland, Iceland, and the UK. Air Chief Marshal Peach is flagging up that Britain and its Nato allies lack the subs, ships and aircraft to sustain constant vigilance. Our correspondent notes that the UK will get new Maritime Patrol Aircraft within the next decade, but until then is reliant on Nato support to spot subs. Nato's former top military chief, Admiral James G Stavridis, is also concerned. "We've allowed this vital infrastructure to grow increasingly vulnerable and this should worry us all," he said recently. What would happen if the cables were cut? Keir Giles, an expert in Russian information warfare who works with the Chatham House think tank, stresses that this is not a new concern. He thinks it's unlikely to happen as the economic fallout would also affect Russia "but it is definitely a scenario for which they are practising". And if it did happen, the damage would be considerable. "The fact that people wouldn't be able to log on to Facebook would be just a tiny, tiny aspect of all the disruption that would be caused if these cables were interfered with," says Mr Giles. "International trading and financial transactions are managed across sub-sea cables. The economic impact would be enormous and immediate." He believes Russia is conflict-proofing itself, "seeking to reduce its reliance on the correct functioning of the internet by setting up its own parallel systems", and rehearsing for what would happen if its internet connection collapsed. Russia is not the only nation with an interest in undersea cables. During the Cold War, for example, the US attached a recording device to a Soviet cable to learn more about the USSR's submarine and missile capabilities. However, Mr Giles says it's the only state "with an intensive programme looking at ways of isolating targets from information". Has Russia attempted to disrupt UK cables in the past? We can't be sure - it's classified. "They are probing the vulnerabilities of civilian communications infrastructure," Mr Giles says. "You can't see what they're doing underwater. You can see what they're doing on land or with satellites. "What Russia learned from Crimea is that in order to take over communications for a target area you don't need expensive cyber weapons, you don't need noisy and disruptive techniques like denial of service attacks. "All you need is physical access to the communications infrastructure and telecommunications expertise embedded with your special forces. "They've been looking everywhere. They've been looking on land in the United States, they've been looking on land in eastern Europe... Anywhere that might in future be in an adversarial relationship with Russia should be concerned about this fixation that they have on achieving information dominance."